We are the fifth generation of the Goutx/Aurignac/Traynor family to farm this land. The happy couple pictured on our tins is Greg’s maternal grandparents, Paul and Helen Aurignac, circa 1938. 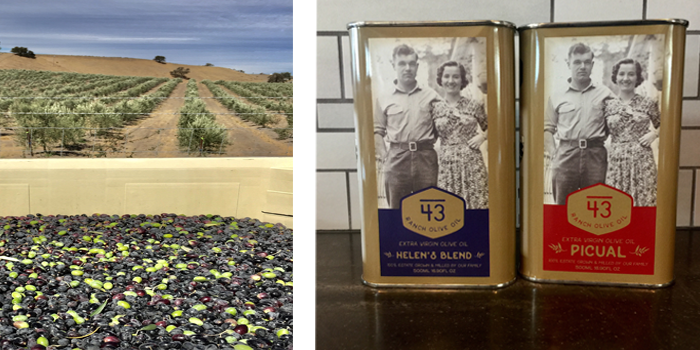 Everything in our process focuses on creating premium, small batch, craft, extra virgin olive oil. We hope that you can taste the passion that comes from our love of the land we call 43 Ranch. 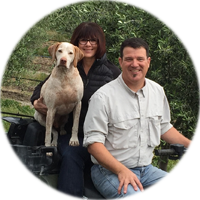 We planted our grove in 2012 and had our first harvest in 2015. We have 4,800 Picual, Leccino, Lucca and Pendolino trees planted in a medium-density format. We are currently constructing a building to house our operations and a new Pieralisi olive mill. We will be open to the public in October 2017. After five years of drought, the perfect day is any day it rains! Seriously, perfect days happen in the fall when we hand harvest, mill, and have harvest parties with delicious oil directly from the mill. Online and every other Thursday at the Carmel-by-the-Sea Farmer’s Market.